Not really sure what to call this, so I’m going with “#2”. If that’s completely wrong, here’s hoping somebody gets back to me. As for this issue, well, Steven went with the artist I liked the least from the anthology (Rami Efal) and had him do both of these stories. I didn’t like him because his art just isn’t my thing, all shadows and odd angles. These aren’t fast-paced stories and they’re not really meant to be, I don’t think you should have to work this hard to follow what’s going on in the panels. Just my opinion, of course, and I’m sure there are plenty of people who will love this. 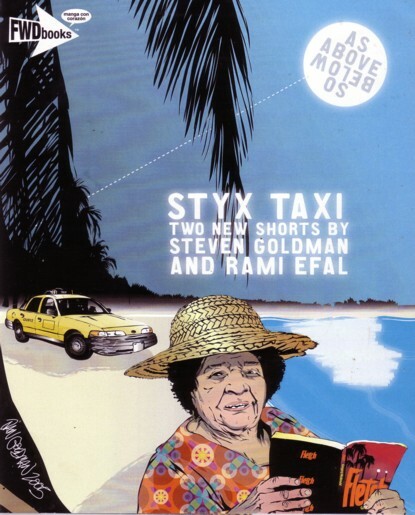 Frankly, Styx Taxi is a great example for the troubles of the small press comics world. 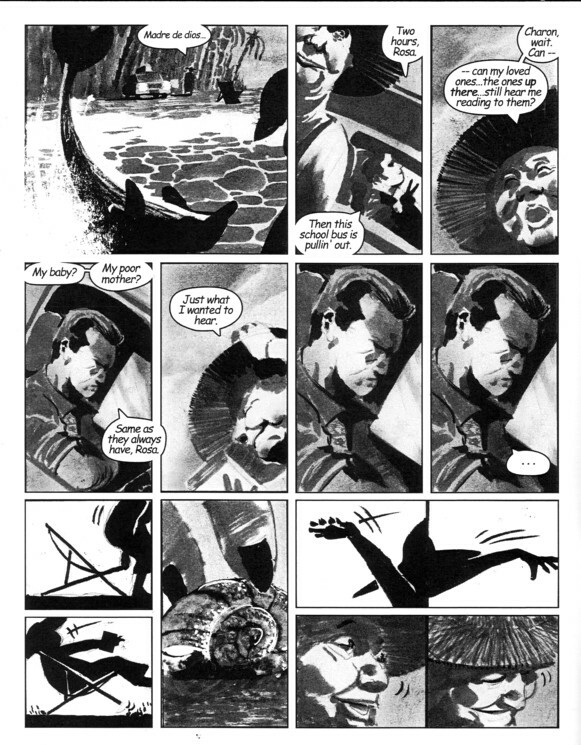 If he had done even ten issues right off the bat, maybe “Styx Taxi” would be recognizable enough to warrant an anthology and another book with only two little bits of stories. It was (and is) such a great idea, I was really hoping to see more. Instead there’s just one absolutely perfect issue, one pretty good issue and this. The stories in here are fine, one about an old lady who dies in the middle of reading a story ro her dead relatives, the other about a young man who doesn’t have anywhere he wants to go when he dies so he invites the cab driver to dinner with him. Also in here are bits from a projected novel that were pretty entertaining, if it comes together. Look, this is pretty far from a bad comic book, it’s just that I saw this book as really taking the comics world by storm, but instead it’s been 4 years or so with only 3 issues put out, and Steven is going back to grad school soon, so I doubt if there will be a ton coming here in the near future. It’s just frustrating to get into a series and then have it either dumped or put out so slowly that you can barely remember hat the point of the whole thing was in the first place. Which is more of a reflection on the sins of the whole industry than this one comic, but here’s hoping you can at least see what I’m trying to say here. if you have a comic with the potential to be this good then, by god, why not start cranking out the issues? You know, when I got this issue, I thought that there was no way it could work. An anthology issue, with three different artists? Already? There’s only been one regular issue! It seems that the creative team is busy doing different projects, which is fine, but if this is your main thing, you have to spend the time and effort to get it off the ground first! Then I read the comic, and it turns out that they can wander around and take their time if they want to, as they still have plenty of ideas. 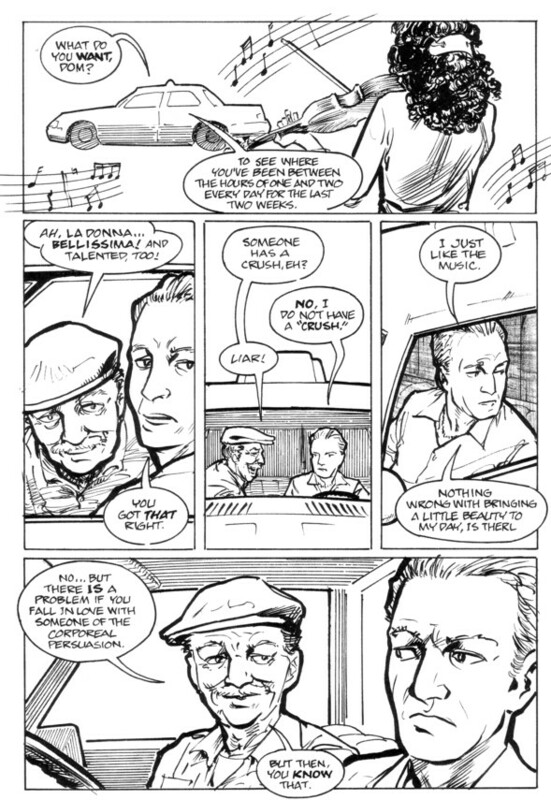 The first story (Goldman & Dan Goldman) in here is an unspoken tribute about the taxi crew on 9/11, trying to keep up with the dead. 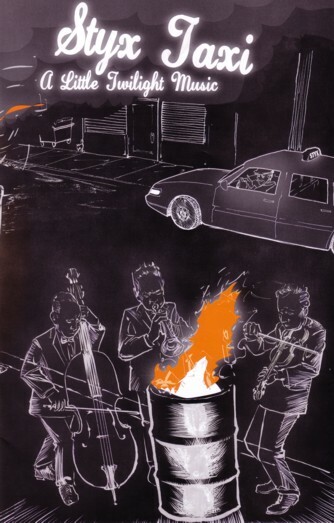 The second (Elizabeth Genco & Leland Purvis) is about Charon’s habit of enjoying a street musician perform and his inability to ever leave the taxi. The third (Goldman & Rami Efal) is about babies having babies, with a little death thrown in. The first two were fascinating stories, no problem there, but the third was a bit of a mess and hard to follow. Still, good stuff all together, and this universe gets more interesting all the time. $3, contact info is up there.